Buried: 27 Aug 1869, East Sheen & Richmond Cemetery. Evelyn was born at Nottingham on Wednesday at half past eight o'clock in the evening. Frederick's neice Arabella Emily Parkinson (nee Quilter) was a bridesmaid at their wedding. In 1871 Mrs Julius was made a Life Governor of the Royal Hospital (Richmond Infirmary) in recognition of her work with the hospital. Reference ID:p 215 no 1713. Richmond Churchyard on a slab. Ellen Hannah wife of F C Julius Esq M.D. 1. Letter from Ellen Smith, 19 Jul 1831, Staly Bridge Manchester. I hope my very dear Friend that I have not been too long in answering your kind letter, for which I thank you, it gave me very great pleasure to hear from you. We were very sorry to hear that Uncle Churchill was not well when he left home, I hope he has returned quite recovered and enjoyed his journey. I wish you could walk with us in Aunt Harrison's beautiful garden: the rose trees are very beautiful, but everything is shaded with smoke from the Town as Staly is now called. We have not been out much, except into the garden: occasionally we have taken a walk in the evening. The week before last week went to Manchester and saw the Rail road, we saw a train of carriages go out, it is a very pretty sight. We called (last deleted) yesterday to see Mrs Cheetham: she is very infirm, but Mamma thinks she looks better than when she saw her two years ago, she is much as usual. Mifs Cheethams are pretty well Sarah Jane Bailey is better I had a very pleasant walk with them one evening to Ashton. We have attended the Independent Chapel at Ashton, on a Sunday, and have been very much pleased with Mr Sutcliffe it is very delightful to meet with a person we like so well when one is from home. Mamma has not determined whether to go to the Lakes or not, I wish you all could meet us there how delightful that would be. Is Cousin Mary as much pleased with Mr Buckingham as you and I were? I am glad he does not think the Charter will be rescued(?) I hope we shall every one be at home when he returns to give his course of Lectures. Where are you going to this summer do you think we shall meet at the lakes? We heard from Mifs Strivens on Saturday, she wrote from Camberwell where she had arrived quite well. She proceeds to Ramsgate today. I hope the change will do her good. We were very glad to hear from Mr John Cheetham that you are much better. I hope you will soon be quite well, and also return with the same kind of roses you so kindly wished me to have. Have you heard from Mifs Reads lately, I hope they are well. We little thought when we last saw each other that we should both so soon have to mourn the lofs of a dear relation. I feel the lofs of dear Aunt more than at first, sometimes it seems like a dream that she is gone, but it is too true. But it is wrong to complain or wish her with us she is far better off, and it will be happy for us if our last end is like hers. How is Mr Bailey? he will I hope be spared some time longer to his family and friends. Mamma was much pleased to receive a letter from Mifs Deverill on Sunday. Mr D Harrison was at Liverpool yesterday and tells us that the money received for pafsengers on the Rail road in the race week amounted to L4500 and the receipts last week were L3700 it is almost incredible. If there was one between Nottingham and Manchester we might see each other now and then. I hope you will be so kind as to write again soon we shall want to hear how, and where you all are. I hope Cousin Mary will be so kind as to write too. Mamma writes with me in very kind love to yourself, Uncle, Cousin Mary, Mr and Mrs D. Churchill and family. Aunt H desires her respects. We hope soon to see Mrs D. Churchill and Charlotte Ann at Staly. 3. Census: England, 8 Apr 1861, 2 Old Palace Richmond SRY. Ellen is recorded as a wife aged 46, no entry as to where born. Ellen married Dr Frederick Gilder JULIUS MD FRCS  [MRIN: 54], son of Dr George Charles JULIUS  and Isabella Maria GILDER , on 26 Feb 1841 in St Marys Nottingham. 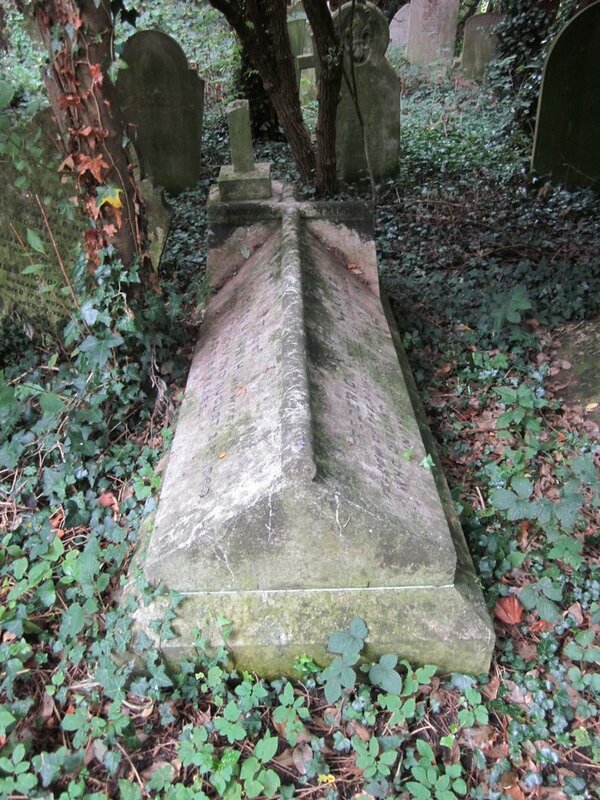 (Dr Frederick Gilder JULIUS MD FRCS  was born on 28 Feb 1811 in Old Palace Yard Richmond SRY, christened on 29 Jun 1849 in St Mary Magdalen Richmond SRY, died on 4 Jan 1886 in 4 Portland Tce The Green Richmond SRY and was buried in Richmond Cemetery..). The cause of his death was bronchitis.